How Does Minitab's Multi-user Licensing Work? As a sales rep here at Minitab, I get a lot of questions from people who know they need Minitab but are just not sure which deployment option would be best for their organization. We offer a couple of different deployment options and payment schedules. One of our most popular license options is the multi-user license. Multi-user licenses are concurrent-use licenses (sometimes referred to as "enterprise licensing"). Your IT folks would install the Minitab License Manager service on the server. The actual Minitab Statistical Software would be installed directly on your PC (and as many other computers as they would like—the number of installations is unlimited). Each time you open Minitab, it will quickly look to the server to see if there is a seat available. If a seat is available, Minitab will open. 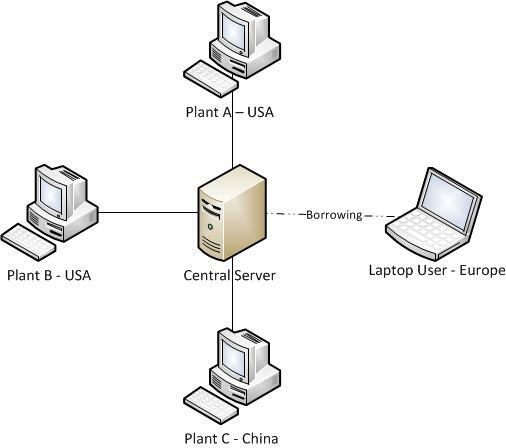 Below is a diagram to show the relationship between the Minitab License Manager on the server and the network client computers. For more details, check out Minitab's Installation Guide. You have the option to go global with your multi-user license. If there is one central server that all locations can access, multi-user licensing can really be an advantage. Imagine the users in the United States switching off for the evening and your Asian offices lighting up a couple of hours later to use those same seats of Minitab. Because Minitab is used in countries around the globe, we offer several language options as well. All languages or just a few can be installed on end users' computers at no additional cost. The language option in Minitab allows users to switch between languages easily. You might be saying to yourself, "Multi-user licensing works well for my colleagues with desktop computers, but I have a laptop and use Minitab while I'm on the road, unconnected to the network. What about me?" Minitab's solution for you is called "Borrowing." Borrowing allows you to "check out" a seat of Minitab from the server before you leave the office. You can then run Minitab off-network. As an alternative to borrowing, you could install one seat of the multi-user license directly on your computer. This would be considered a "stand-alone" type of install and would decrease the number of seats you would have available for concurrent use on the server. Many companies allow dedicated, stand-alone installs for heavy users of Minitab. In addition to the standard multi-user deployment I described above, there are some variations such as redundant server hosting, virtual server deployment, and remote access systems such as Citrix. To discuss these other options in more detail, please contact your local Minitab representative. The purchase information for multi-user licensing can be found on our Pricing page.